Another blog tour you say? Why yes! 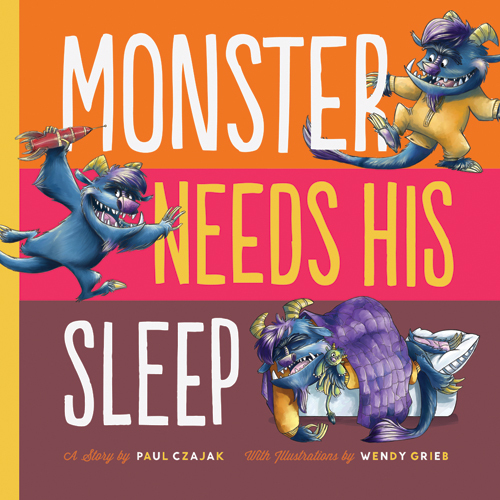 We're back and celebrating the second book by Paul Czajak and Wendy Grieb, Monster Needs His Sleep. Monster and boy are her once more, travelin' along a little blog tour! So jump right in, discover a treat. One little click and your day is complete! April 8 Carrie On… We hear there is going to be a really hilarious video… April 15 Find Paul HERE on the Scarletta blog! He’s celebrating publication day by taking over the Scarletta blog! April 17 Teach with Picture Books The first giveaway you say? Better not miss it! April 21 Kid Lit Reviews Monster always has a lot to say, and this delightful character interview will be no different. April 30 Lil' Blonde Monsters Sneak a peek at this great images from the book while learning about the book! May 6 There’s a Book Missed the first giveaway? Never fear, enter here! Plus the cutest interview you might ever read! (Hint - it's from a 7 year old!) May 12 Kid Lit Reviews We’re back! This time for a review and giveaway to celebrate Children’s Book Week! May 14 Sharpread 5,4,3,2,1… Find out the deets on Monster Needs His Sleep in this fast-paced, by-the-numbers interview to wrap up the tour. And don't forget to pick up the book from your favorite vendor - it hits shelves April 15!